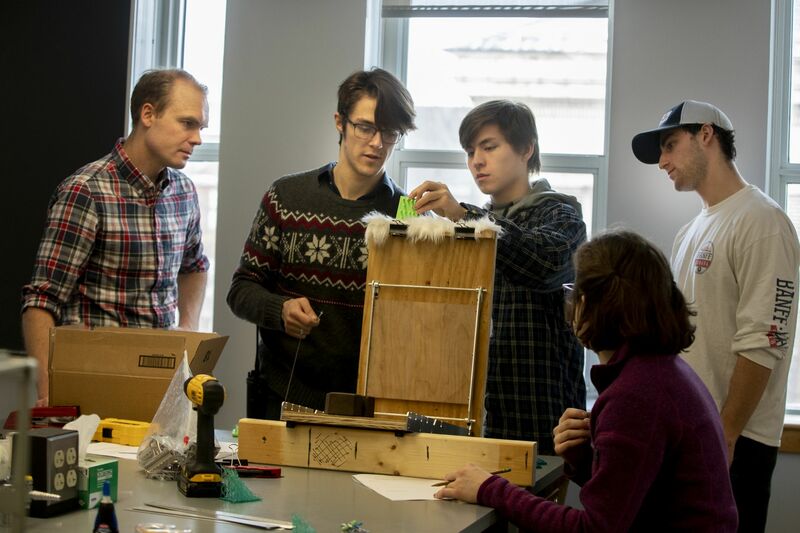 One day in a lab in Carnegie Hall, Ruth van Kampen ’19 of Brunswick, Maine, and Josh Turner ’20 of Andover, Mass., tied weights to a rectangular plastic brush and let it fall through a piece of synthetic fur, mounted vertically on a wooden contraption that machinist Peter Beach made for them. 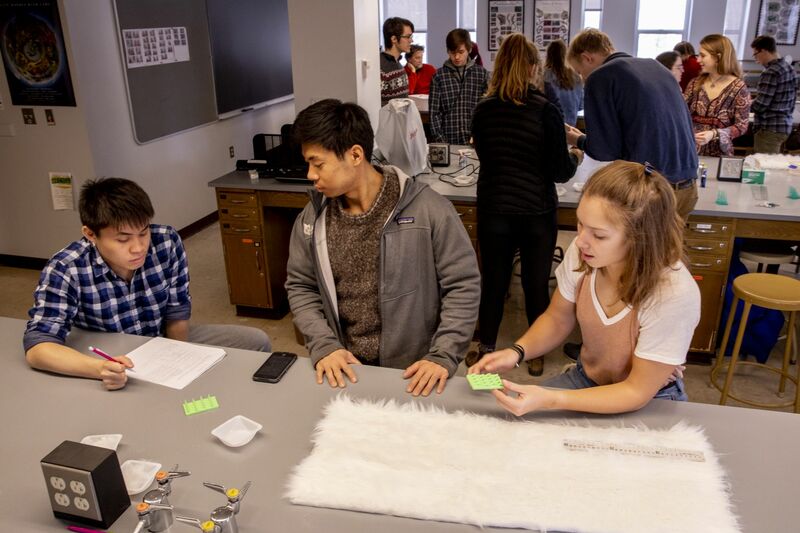 Around them, other students in groups of two and three huddled around their own pelts, pulling brushes through the fur a certain number of times and measuring the amount of hair — or in one case, raisins — that came out. Assistant Professor of Biology Andrew Mountcastle moved among them, answering questions and, in one case, shaving excess plastic off a brush. 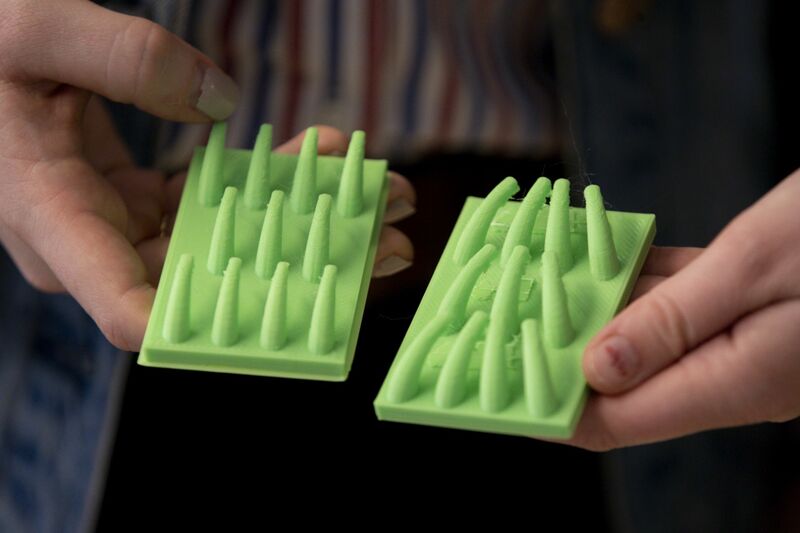 The scene was the culmination of an assignment for a course in which students designed, 3D-printed, and tested two different brushes, both modeled on one of nature’s best groomers: a cat’s tongue. 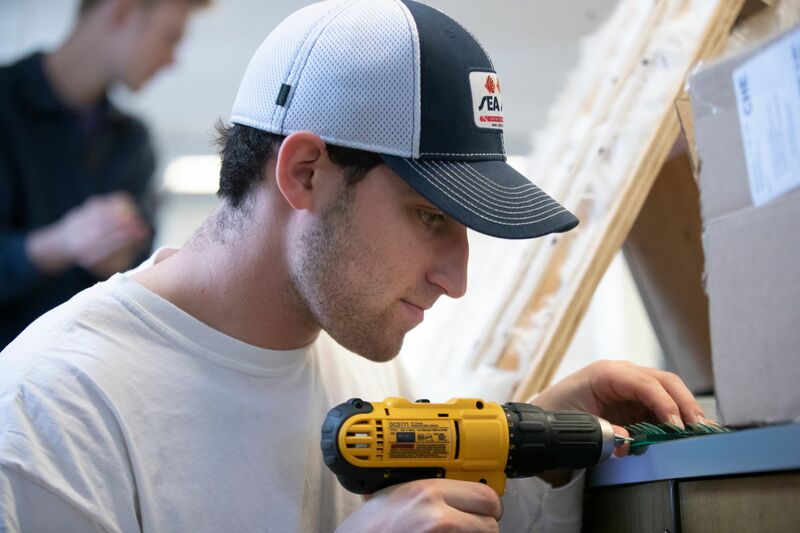 The course, “Bioinspiration and Biomimetics,” looks at how living beings can inspire human-designed objects, from wind turbine blades that take after insect wings to nonstick condiment bottles modeled after lotus leaves. Mountcastle became interested in the brushing potential of cat tongues after reading a scholarly article arguing that a brush modeled on the tongues requires less force than a regular brush to get through a section of hair. He decided to have his students design their own cat-tongue brushes, then test their effectiveness. First, the students looked at cats’ tongues under microscopes, where you quickly see why cats are such effective groomers. Their tongues are covered in hundreds of tiny curved spines, made of the same material as human fingernails. The spines, called papillae, are why cats’ tongues feel like sandpaper, and why they’re so good at getting loose hair and other debris out of fur. The students sketched and measured the real cat tongues. Then, using the SketchUp computer program, they designed their two brushes: one modeled as closely on a real cat tongue as possible, the other with some modification — for example, increasing the spaces between papillae. In testing the brushes’ effectiveness, they’d be able to understand how particular aspects of cats’ tongues affect their performance. The modifications varied. One group made the papillae more hooked than a cat’s. Another made the papillae longer; another changed the angle of the papillae relative to the surface of the brush. Van Kampen and Turner noticed that real cat tongues’ papillae had small “scoops” on the end; they designed the experimental brush without the scoops. The students also tested how well their brushes achieved different objectives. Some covered their pelts in loose fur, pulled their brush through, and carefully weighed how much hair the brush picked up. 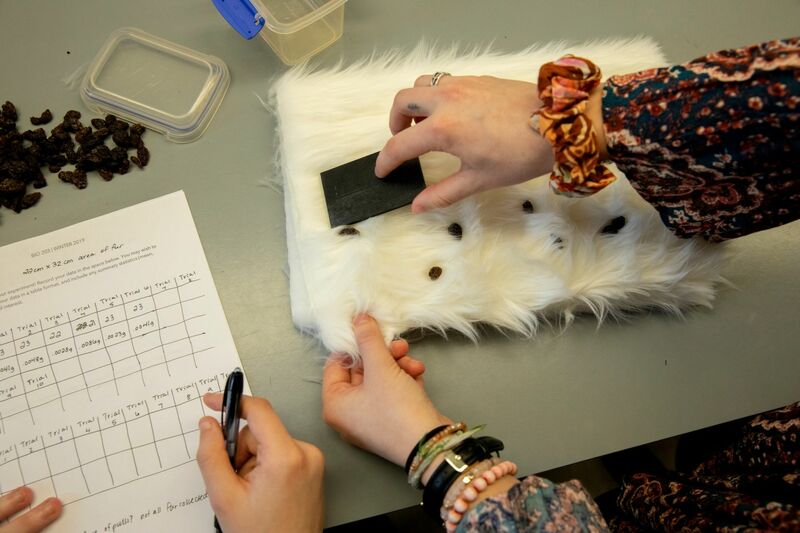 One group dropped raisins in the fur to represent fleas and compared their brushes’ ability to pull them out. Van Kampen and Turner noticed that the scooped cat tongue brush seemed to require less force to get through the fur than did their scoopless brush. That cat tongues generally worked better was interesting but not surprising, van Kampen pointed out — after all, cats’ tongues are the result of millions of years of evolution, as opposed to a couple of weeks with design software and a 3D printer. “To find out it holds up in an experimental setting is really cool,” she said.